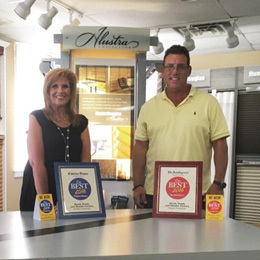 Serving Pennsylvania, New Jersey and Delaware, Blinds Shade and Shutter Factory is a fourth-generation family-owned business. Owner Bob Silver recounts his family’s start in the home goods business. Bob has personally been in the blinds business for over 45 years and the company itself has been around since 1982. His knowledge in business speaks volumes about service and craftsmanship that Blinds Shade and Shutter Factory offers, as well as relationships built with many generations of customers. My grandfather originally had a store in Philadelphia that sold all types of curtains. My father was also in the business for many years and he branched out to be one of the largest linen distributors in the city of Philadelphia. Around that time, blinds were becoming very popular in homes and we decided to bring in blinds and window coverings for our customers. In my 20s, I decided to go out on my own and build my business selling several different types of blinds for retail and commercial establishments. Our business grew quickly; I then decided to start manufacturing blinds in my factory. After 10-plus years we moved away from manufacturing and we started carrying top quality brand names such as Hunter Douglas, Graber, Norman, Comfortex and many other companies. As we expanded our services, we decided to expand to include measuring and installation. We also have a Repair Center on our premises and we have one of the largest blinds repair facilities in the region. Shutters have become highly popular and the fastest growing trend in window coverings. They have become the “furniture” in window dressings. We provide custom coloring and offer the popular Plantation Shutter in white but also many wood stains. They last a lifetime and are easily maintained. Our Plantation Shutters are very popular at all shore points and we will gladly design your shore home. We are able to design and install many shapes, sizes and styles to fit your home. Shutters come in solid core vinyl and solid wood. There are very few window covering specialty stores that offer what we offer as far as commitment to our quality of products and excellent customer service. We manage to carry an array of products that give our customers the best value and options out there. This selection of products includes everything from honeycomb pleated shades, cordless blinds, horizontal blinds, roller shades, roman shades, sheers and shadings, vertical blinds, cornices, and motorized lifting systems that can be operated with a remote, power touch, iPad or an Amazon Echo. We have expanded into home automation, which is growing so quickly not only for those hard to get to windows over a bathtub and Palladium windows in foyer but for convenience. We also install shutters on Patio and French doors. We work with all budgets to get the most for your money. We promise to dress your windows in the best style that fits your home and your lifestyle. We have design consultants on staff to assist with your decorating needs. Come visit our beautiful showroom to see the many different choices and styles to fit your home. When you make a purchase from Blinds Shade and Shutter Factory we set up an in-home consultation during which a window treatment expert brings a wide selection of samples to your home to determine firsthand what will work best as far as application, color and style. We want you to happy with your purchase instead of guessing what it will look like.